The Student Research League tasks students with formulating a solution to an open-ended research problem. The 2018 challenge centered on determining the safest place in the United States to live, based on exposure to natural disasters. Participants selected mathematical tools that best fit the problem, collected data, created a mathematical model to reflect the data and researched and interviewed STEM (science, technology, engineering and math) professionals to gain a greater understanding of the topic. Students had nine days to generate their solution and present it in the form of a thesis defense. Based on their research, TCC Northeast students Jassmine Garcia, Shelby King and Sao Nguyen identified northeastern Ohio as the safest area. 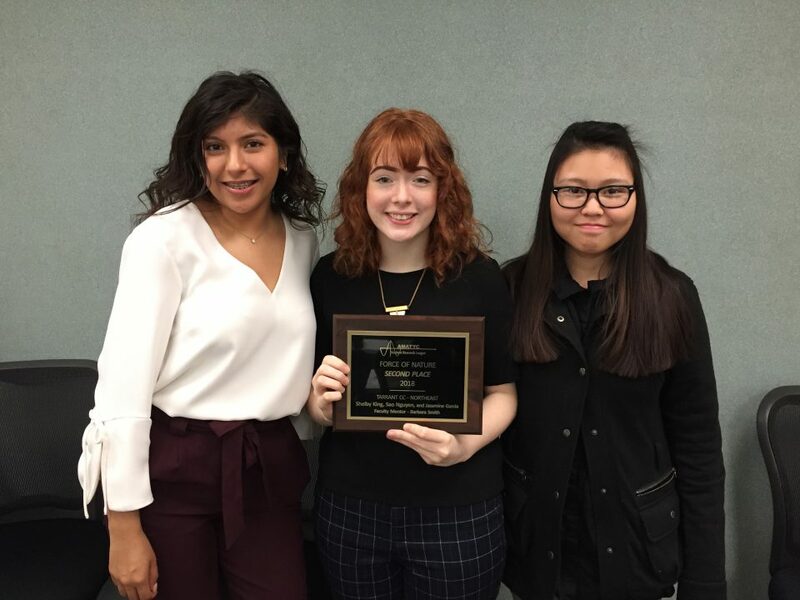 The team, mentored by math faculty member Barbara Smith, placed first in the Southwest Region last summer and second in the nation in late 2018. Each student won a $500 scholarship. TCC Northeast’s Infinity Math Club recognized the team members at its January meeting. Garcia is a mathematics major studying to become a teacher. King is a computer science major who hopes to become a software engineer for a company like Pixar or Google. Nguyen is a computer science major who wants to pursue a computer programming career to make technology more convenient and innovative. The 2019 Student Research League takes place April 5-15. For more information, contact Pace at karen.pace@tccd.edu or visit the AMATYC website.